NOTE: This restaurant has ceased its operation at Penang Times Square. Thursday was the opening day for two new restaurants at Penang Times Square. Needless to say, most people would have known about the delicious ice creams served at Swensen’s. In fact, they have added some new local dishes that did look real impressive in terms of photos and pricing with the same “buy one eat the next one free concept”. The other newly opened restaurant would be Bukotsu Ramen House with a simple dining layout downstairs and a Japanese styled “sit-on-the-floor” concept upstairs. Since I’m a spicy food lover, I have decided to check out the Volcano Ramen (RM12.90). The texture and springiness of the ramen was good. The dish came with an almost curry noodles type of soup (except the taste of lemongrass), rich in flavorful stock, with a slice of the pinkish Japanese fish cake, half a hard boiled egg, a few large slices of BBQ pork (char siew), bean sprouts, chopped spinach, corn kernels, chopped spring onions and a spoonful of chili paste. The chili paste was somewhat like the Korean chili paste, chili hotness minus the oil. It was supposed to be a spicy hot dish but I found it to be real mild. Moreover, the portion was too little as a main dish for the price paid. Even with the side order (one discounted side order allowed per bowl of ramen), I did not feel full at all. 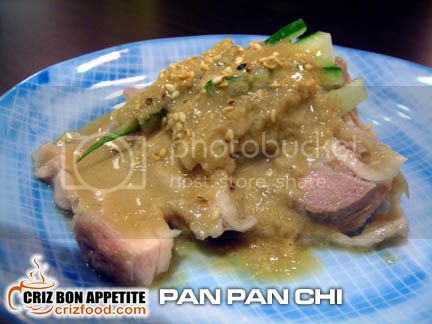 The side order was Pan Pan Chi (RM2 in a smaller portion compared to RM8 for a larger serving from the ala carte menu). This is in fact a cold dish. The smoothness of the chicken slices was great, combined with the tenderness and juiciness of each slices. The dish has sliced cucumber with dressing that tasted quite like concentrated miso paste and garnished with some roasted sesame seeds. This dish would be beautiful as starter. The next order was the Chicken Teriyaki Bento (RM16). At least the price for this dish quite justified with the dishes ranging from miso soup, appetizer (kimchi), salad (finely sliced cabbage/purple cabbage and carrots with sesame oil and fish sauce, served with cucumber slices), chicken in teriyaki sauce, Japanese rice and dessert (fruit cuts). As for the soup, I prefer it to have a stronger miso flavored broth. The kimchi was normal as it contained more vinegar and was not as spicy as it should be. The salad was fine but it was nothing real special on the dressing. The chicken slices, cooked in teriyaki sauce has the quality of a good dish but it was too diluted to my liking, especially when I tried to dip my not so compact Japanese rice pieces. The chef should have made them more compact to avoid the rice to loosen wildly when use chopsticks. The fruits were just watermelon and papaya. Dobin Mushi (RM8) would be a must order for soup lovers. The soup has been double boiled for more than 24 hours and it was rich in flavor. It came in a cute ceramic teapot with a nice teacup and a slice of lime. In the teapot was some chicken slices, a prawn, carrot slices, a pinkish Japanese fish cake, mushrooms, ginkgo nut and some chopped spring onions. I prefer this dish to be taken in its original form although adding some squeezes of lime juice did give it a bit of sourness plus reducing the strong aroma of the chicken soup. 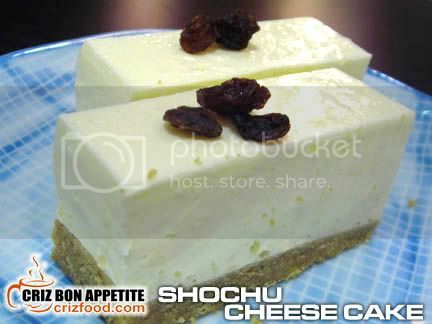 Shochu Cheese Cake (RM7 for two slices) was served as dessert. Shochu or soju as it may also be called in the US export market is actually a distilled beverage made out of barley, rice or sweet potatoes starches. It has a 25% alcohol volume. It has a nutty taste compared to the fruity taste of sake. I found the cheese cake to be far less in the taste of shochu. It was too mild with the overpowering taste of milk with a less cheesy taste. In fact, the dessert had too much of gelatin added, thus it was rather hard. Moreover, too much of butter had been added to the digestive biscuit type of base and it was too salty to my liking. Maybe margarine would be a better choice to firm up the base for this dessert. Green Tea Ice Cream (RM3.50) was served free just for the opening day. 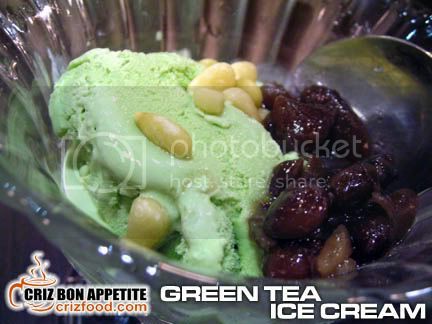 The ice cream came with some sweetened boiled kidney beans and some pine nuts. The kidney beans were just nice for my sweetness but it would be better if they were to be a bit softer. The pine nuts were nicely roasted but the ice cream to me tasted a bit too artificial. Although it was creamy and smooth, it has a strong taste of commercially produced green tea powder. Let’s hope the restaurant would look into a better alternative or solution to this dessert. 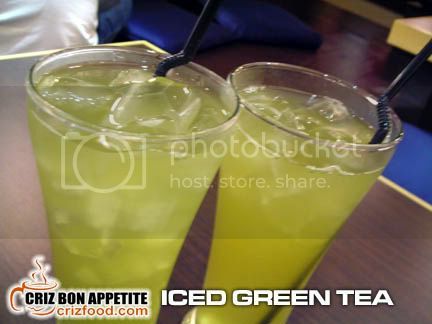 Iced Green Tea (RM1/glass) was served free flow for the day. 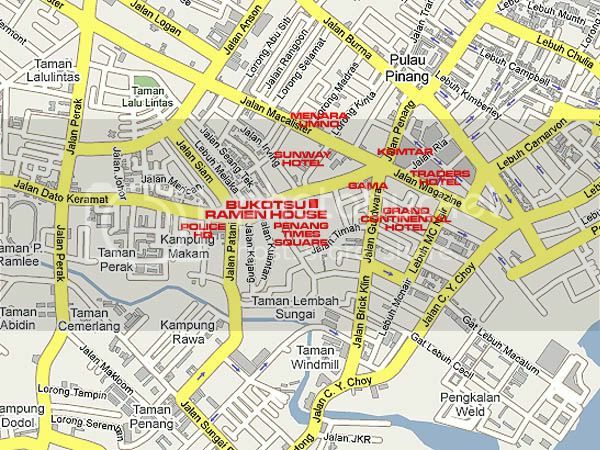 The best way to reach the shop would be by using Jalan Magazine (Traders Hotel). Drive into Jalan Dato Kramat (2nd junction at the right of Gama Supermarket) until you have reached Penang Times Square on your left. Find a parking space along the road or within the allocated parking bay. Just walk into the mall and go to the open space area with all the fountains. The restaurant is located at the same row with Marrybrown, Tsuruya Sushi Bar and a few shops away from Swensen’s and Roti Bakar Kopitiam. 73 Jalan Dato Keramat, 10150 Penang, Malaysia. This is an interesting menu… definitely not just your standard teriyaki-teppanyaki-tempura configuration. Is Times Sq really changing the gastronomic landscape of Penang?? I must find out! Min.. Penang Times Square is trying to set up the concept as you had mentioned. Presently all the ground floor shop lots are food related with the exception of only two restaurants within the premises on the first floor (Haven Delights & Golden J&C Express). 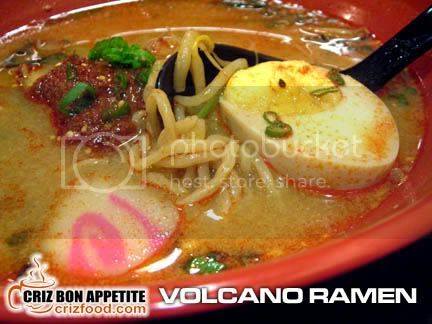 Wow… the volcano ramen looks nice…. and the Dobin Mushi looks interesting…… should try out next time when I visit Times Square. You should try them out. Some of the items there could be real nice. another jap restaurant in time square? They ought to give a bigger portion or more competitive price to stay afloat in all these new food outlets!!! Yup… with so many restaurants, especially those in the Klang Valley having promotion and at least 30% reduction in price for their food during this bad economy, I think restaurants in Penang should do that too. alternatively, a bigger portion would surely justify on the price. Well, it’s definitely not the Prangin Mall concept with all the shops scattered all over. Moreover, they presently do not have any anchor tenant. At least, all the food outlets were grouped at one prominent area. Seems like more improvement is needed for this new restaurant huH? Well, it’s their first day opening so it must be rather chaotic. I would surely go back for more after they are more settled down. Anyway, one of the partners did apologize for the little hiccups. actually i work over there la. but i found that the food really delicious. not i want to promote the shop but the food really delicious. i am trying when opening and also go back today, they really improved a lot.i really love their ramen, really nice.